This is BY FAR my favorite of the Duro Jrs! I love what you did with the stripes at the waist and the sleeves. I agree–this is my favorite of the series! It’s just lovely even if there are a few happy fun time jitterbug sparkles mixed into the project. Definitely like this one. Also, thanks for the link to Antique DH pattern, got it! And I love the way the back matches the print! Beautiful! I try not to call them mistakes…they are “design decisions”. I love the whole 50’s feeling that fabric has. I want to go to Tomato! PERFECT!! Like all your other commentors, this is the best Duro Jr, yet. Love the fabric, love the combination, love it all. Wow!! This is just awesome; definitely my favorite, as well. You did a BRILLIANT job taking advantage of the pattern. Well done. So so so so pretty, Erin! I second the push it into fall vote. A nice little cardigan and you are set.Excellent colors and what mistakes? I see some clever design interpreting, that’s all! Love your dress. I broke down and bought this pattern at a Labor Day sale. I must find some nice fall color fabric – will be hot here for a long time – but I guess I could get in the spirit with the color at least. I am dying to make it. This is totally my favorite fabric so far–loooove the way the print works with the shape. Yum! Wear the crap out of it ‘fore the coldness sets in! 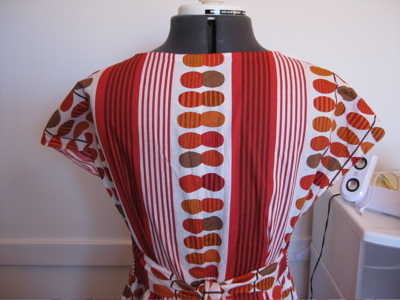 Absolutely my favorite Duro – the fabric seems perfect for this pattern. Best, best, best–I really love the stripes and the reiteration of stripes in the leaves. A beauty. This dress is really lovely, Erin — beautiful fabric!I almost bought this pattern this weekend, I didn’t even recognize it as the Duro Junior…d’oh! This is Chicago. 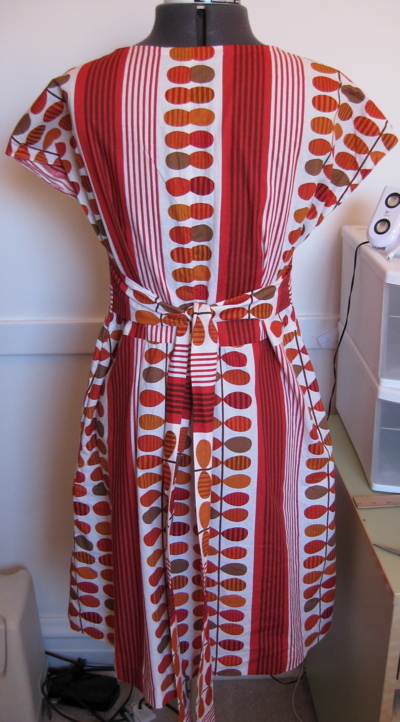 You may well have another month (or two) of weather warm enough to wear this dress in. Or not. You never can tell with Chicago. I’m with everyone else- This is my favorite! My fave also. Awesome print! I’m with the majority — this is the best of your Duro Jr’s.Surely a red cardigan, black tights, and a slip underneath would stretch the wearing time until late September. When I lived in New England I would often layer up several skirts to keep the chill off my legs. Two or three layers of cotton in fall and spring, two or 3 layers of wool in winter (Much warmer than jeans — at least if you like your skirts mid-calf to ballerina length so they would come down over the top of the snow boots). “happy fun time jitterbug sparkles” – i’m totally using this the next time i make a sewing mistake. there’s nothing like a smile to diffuse a situation. Your Duros/Jrs. are getting so great, Erin. This dress is really sophisticated. Nice job. That is simply super fabric. And I DID recognize it as the fabric you got at Tomato…I said to myself…”hey, I know that fabric!”Thanks for allowing us all to follow you around on your adventures. Sometimes it can feel like stalking…but it isn’t. 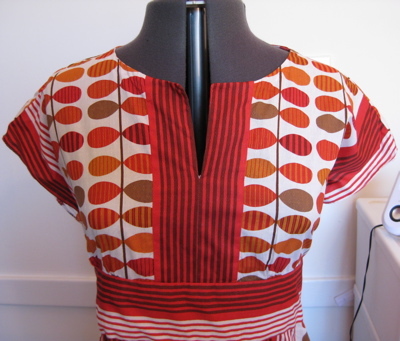 I love this Duro Jr. Fabulous use of this fabric. Thanks for hipping us to this pattern – even though I’m pregnant at the moment, I plan to buy the pattern and make it next summer. That dress is lovely. And the fabric is adorable. I don’t suppose Tomato has webstore. Then again, I probably wouldn’t be able to translate it even if they did. Does anyone have any ideas where to buy fabric like this online? Erin, I’m going against the tide here. It’s a lovely dress, but….Surely you have done enough sewing now that you can use a coordinating thread or backstitch at the top of the neck slit. And why would you put that seam in the back? Would you get sloppy with spelling? I think not. You pick such lovely prints. Put in that little extra effort and make you dresses look professional, not home made. After all, you are wearing them in a professional capacity, not just around the house. I love this dress!! I love the fabric……too bad I can’t sew! 🙂 Maybe one of the famous Duro dresses will make it into a box of goodies headed to Jax?!??! What a lovely late-summer juicy tomato of a dress! And thanks for the implied permission to make mistakes, and call them jitterbug sparkles. Why not? To respectfully disagree with engineer beth, while you are a professional (insofar as you have a profession), you’re not a professional dressmaker, you’re a happy amateur! Nothing wrong with that. My favourite of your duros ever!!! Simply charming. 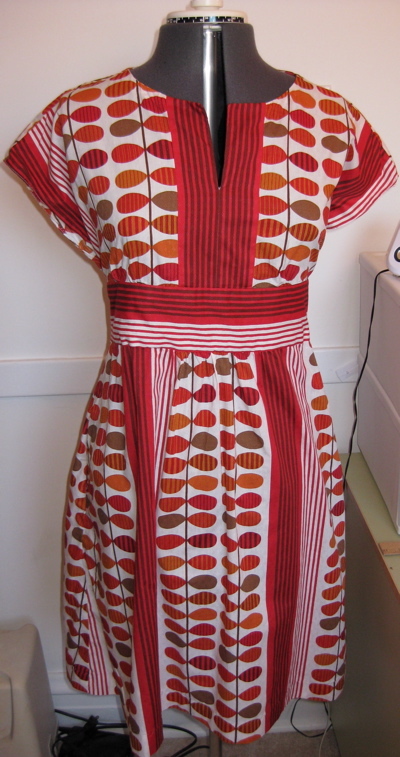 The fabric reminds me of Orla Kiely’s fabrics. Her clothes and bags are really cute. Oh, I love this! I am with Engineer Beth, though. You are at a point where with a few seconds of planning, you would have anyone who stood behind you thinking “Wow! Where did she get that?” Not, “What lovely fabric, looks like she made it herself.” It is so nice to say “I made it myself!” to the comment that accompanies the first thought. this? this is the most beautiful duro, jr. or otherwise, that i have yet seen. absolutely gorgeous with that fabric. GORGEOUS! i tell you! I’ve always said that it’s more important to know how to recover from a mistake than it is to not make any.